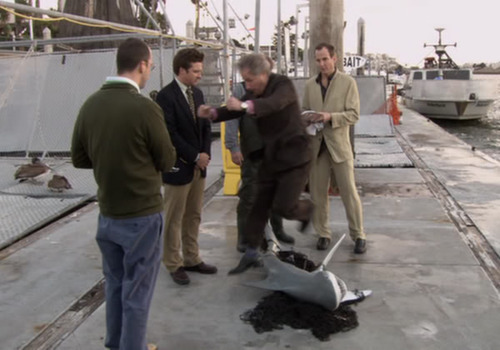 from the Fonz literally jumping the shark on that fateful episode of Happy Days to Barry Zuckerkorn’s subtle homage on Arrested Development, television viewers have discussed the concept now known as “jumping the shark”. it’s the point where a TV show, in an attempt to do something bold and fresh (usually out of an apparent lack of burgeoning creativity) reaches so far as to do something silly, ludicrous — alienating viewers in the process. the attempt is bold new ground. the result is the beginning of the end. the shark-jumping hinge is largely subjective. there was once an entire website devoted to the discussion of just when a certain television show made the fateful squaline leap. for me it occurs when a show forsakes its core premise, usually by letting character relationships take the forefront. consider a popular sitcom like Spin City, which did well early on, then descended into whether or not the two main characters were going to sleep with each other. when Michael J. Fox left, replaced by Charlie Sheen, i don’t recall hardly any major plot points revolving around city politics, which was the engine that drove the show in the early days. the show didn’t last long after that. i see this same thing happening with one of my favorite shows — House. but the writers seem much more aware, perhaps due to the ability to interface directly and immediately with viewer feedback thanks to the Internet, social media in particular. the show sometimes drifts from its procedural nature. whenever the plot focuses on the drama amongst the characters and the disease takes a back seat, it’s my opinion that the show suffers. House writers found themselves with an interesting predicament a few seasons ago. Dr. House became known in the early seasons for his relentless sexual harrassment and professional fisticuffs with Dean of Medicine Lisa Cuddy, his completely unashamed addiction to Vicodin, and his general jerk nature to his supporting cast, made of strong characters (and actors). But at one point recently, we found a Dr. House trying to have a family with Dr. Cuddy, off the vicodin, and in general trying to be a better person. it was a great experiment with the direction of the characters, but frankly, i’m glad it’s over. where we ended up was a general lack of conflict. this season? Cuddy’s gone, a lot of the old cast is around, some new female cast members provide House some sexual tension, the Vicodin is back, and it feels a little more like when the show first started. as TV watchers, we want to follow the lives of the characters, but not at the expense of the basic premise of the show — a brilliant jerk bucking society to solve the unsolvable puzzles of medicine. EVERYTHING else must take second place when it comes to television series show structure. i say “structure” because ultimately, the structural framework of the show is merely the foundation for all of the other things we say we truly love about the show. an interesting thing happens: when the core premise remains the same, the messages, the intimations, the character developments are all more visible. as home entertainment systems rival cinemaplex theaters and film-style production gear and processes come down in cost, television viewers have increasing expectations regarding the production value of the content to which they choose to devote themselves. this leaves showrunners struggling with how to produce cinema-style content within the television series structure. viewers expect the same show every week, more or less, and traditionally have expected to tune in to a program and not need to catch up to figure out what’s going on. LOST has changed this idea, along with 24 before it. apart from being a six-season-long narrative, LOST came about at a time when catching up on a show was — for the first time in television history — easy. i got the first season DVDs for Christmas, then got caught up on the second season thanks to iTunes. soon abc.com, hulu, and Netflix were carrying every episode, which helped skyrocket the show’s popularity. in fact, i venture to guess that LOST might have failed were it not for its availability online. new viewers coming to the show on broadcast found the series’ title apt, as they were often lost as to what was happening, had they not done their due diligence to get caught up beforehand. furthermore, it has spawned numerous similarly serialized shows — Alcatraz, Flashback, Fringe, to name a few. but many shows do not enjoy the cult following that LOST has, and must somehow find a way to entice new viewers each week if they want to keep their advertising. hulu and Netflix are great services for supplementing a show’s fan base, but they do little to supplement the show’s bottom lines at this point, meaning people still have to be watching on broadcast TV. those ratings which exclude digital and DVR viewings then do matter. and thus the quandry for show runners: how to maintain a moving storyline with compelling character development and yet gain new viewers week to week? in the television world, Community may do this best of all. in a recent write-up by WIRED on Dan Harmon, creator of Community, Brian Raftery tells of the infamous circles that line Harmon’s office walls. this story circle is the foundational structure for every episode. and each episode is simply about some quirky “losers” in a study group at a community college. that’s it. but the show has become so much more to its viewers. because the show has been so faithful to that foundation — a solid foundation, at that — Harmon, the writers, and the cast have been able to build three solid seasons of truly redemptive comedy. no shark-jumping in sight. when the show was put on “hiatus” by NBC a few weeks ago, the cast cried out via twitter, and the show’s fans responded. if the show suffers from low ratings, i have to believe its because its core audience is the “losers” of society; the disappointed not-so-young-anymore that have “stuff” but still find their lives wanting; the connected generation, watching it all on their laptops and mobile phones. people like me, who don’t have cable, but have a cable modem; thankfully, every episode of Community is on hulu plus right now. i don’t think we’ve seen the last of Community, by any means. 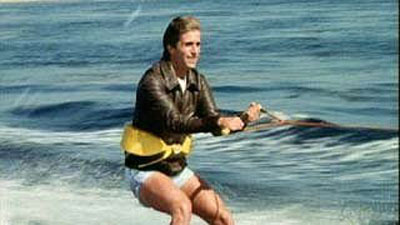 has your favorite story jumped the shark? have you felt the distance between you and your favorite characters? do you think about how it used to be and wonder if you’ll ever feel that way again? do not be decieved: when you deviate from your essential core, everything else around you suffers. a lesson for both sides of the television glass.